Bryan Belay, Director Fisheries Monitoring Division - MRAG Americas, Inc.
Mr. Belay began his career in Alaska with Data Contractors Inc. (DCI) in 1994 as a groundfish observer, received his ADF&G crab observer certification in 1995, gained more than 600 days on over two-dozen vessels, and accepted a position as Operations Manager for DCI in 1997. In 1998, DCI successfully bid for Cook Inlet Marine Mammal Observer Program. Mr. Belay oversaw design and implementation of the program including data entry, debriefing, distribution of coverage, logistics, and hiring of personnel. In 2001 and 2002, Bryan successfully managed the Kodiak Feasibility Study and the Kodiak Island Marine Mammal Observer Program. Bryan helped MRAG Americas successfully bid the Kodiak Island Marine Mammal Observer Program in 2004, and joined MRAG Americas on a full time basis in October of 2004. 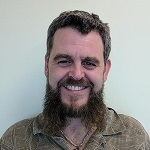 Bryan oversaw the successful implementation of the 2005 AMMOP in Kodiak, coordinated the 2005 IFQ fishery for Techsea International, and helped MRAG acquire its North Pacific Groundfish Observer Program and ADF&G Crab Observer Program certifications.